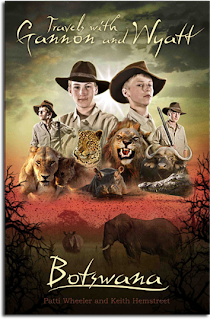 Hop over at 5 Minutes for Books, you can read my review of Travels with Gannon and Wyatt: Botswana. (You can also be entered to win a copy over there!) I stumbled across this booth at the Book Expo and felt an instant excitement for it. I wasn't disappointed when I brought the book home and read it and I look forward to reading more in this series as they come out. Gannon and Wyatt's mother, who is also the primary author of their book, kindly agreed to answer some questions I had about the book. The thing I honed in on was the fact that their family was allowed these traveling opportunities because they were home schooling at the time, which gave them the flexibility that they needed to explore the world. My questions to Patti delve into home schooling a bit and I was fascinated by her answers. I hope you'll give this one a read. #1 - In the book it is mentioned that you began traveling at the age of 17. What drew you to travel in the first place, and where were some of the first places that you went to on your own, as a young adult? I was born in a small town in Northern Florida. My father was a truck driver who traveled the country for a living. When I was a little girl, we had a station wagon and we went on a lot road trips. My parents put up curtains and a big bed in the back of the station wagon, and at night we'd just pull over on the side of the road, have dinner and go to sleep under a lamppost. I loved being on the road and developed a real affection for seeing the world. I used to look at planes flying overhead while lying in the crabgrass and wonder where they were going and wish that I could go there, too. After high school, I got to take my first trip without my family. So, I went with some friends to the Bahamas, and I fell in love with the Bahamas and the Bahamian people. My friends and I lived in caves on the beaches for probably a month and a half. We would go diving for lobsters and spear fishing and then sell whatever we didn't eat in the local marketplace in Eleuthera. I loved it. I decided that there was a whole lot more to the world than South Florida. #2 - You also mention that you started traveling with your twin boys, Gannon and Wyatt, when they were quite young. How old were they, exactly, when you began your traveling adventures and what advice would you give to mothers who want to travel but have small children and feel unable to do so at this time? I started traveling with them when they were about 7 or 8 months old. We went to the Bahamas on a boat trip. And it was great, being on the boat, playing at the beach. But what would I say to mothers? If you want to travel but can’t because of different circumstances, then become an “arm-chair traveler!” Expand your mind and explore the world through all the wonderful books and websites on travel and discovery. You can "travel” the world through photography and literature. If you want to travel with your children, but feel that it's impossible, I would tell you that it's not, You just have to make a choice. Don't put your life on hold until your kids grow up. Maybe you think you can’t travel because you can't handle 2 or 3 kids in a big situation like an airport. Well, I always go back to the saying: "It takes a village." It's true. There's safety in numbers. Maybe you could take along a niece or nephew or another family member to help. If flying isn’t possible, plan a road trip. Site-see around your region as if you were a tourist. And just remember life can get busy and hectic, but you can revel in that. Life is very short and we should seize the day. And know that travel is very healthy and stimulating for your children. Studies have shown that after every experience a baby has that’s outside of normal routine, the baby experiences a cognitive growth spurt. So, do it. Plan the trip well, be organized and then go. And remember that life is messy. Get ready to have a few glitches along the way but appreciate how wonderful it is that you're stimulating your child with these amazing experiences. #3 - I'm sure you've heard it on the news (as well as experienced this for yourself) but people in today's society seem to resent traveling on airplanes with small children. What is your response to this attitude and what advice would you give to mothers who fear what other airline passengers will think of them when they climb on board an aircraft with a potentially fussy child? I would not let that affect my decision to get on a plane. I used to be a flight attendant and had some experiences where there would be a baby on the plane that was fussy. Maybe it had an ear infection and was uncomfortable. But the baby had to fly home, too. When I had an unhappy passenger, I would just quietly try to relocate that passenger. But personally, I don't worry about it because I know that I paid the same amount for my airline ticket as the person sitting next to me, so I have a right to be there, too. And the person sitting next to me may have to be reminded that they were once a baby, too. We cannot always control what babies and kids do, but we do our best. Keep a good attitude, and hopefully others will be gracious, too. #4 - I love the fact that you homeschool your kids and, obviously, the flexibility affords your family the ability to travel. My husband and I were both homeschooled growing up and we plan on homeschooling our own children precisely because we love the idea of being able to be flexible and take advantage of opportunities that come our way that wouldn't necessarily be possible if we were attending a "traditional" school. What ultimately caused you to decide to homeschool? We were in the process of relocating from Florida to Colorado, so it was difficult to keep moving back and forth between the two places. I loved the flexibility of homeschooling and the fact that it allowed us to keep traveling and know that they were getting a great education wherever we were. Also I truly believe that the world is a tremendous classroom and a beautiful place to learn. 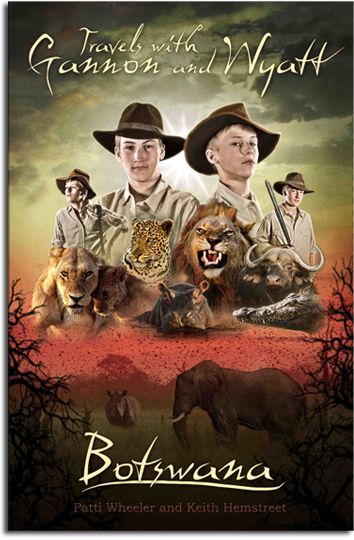 #5 - In reading your book, Travels with Gannon and Wyatt: Botswana, I didn't get the feeling that it is a treatise for homeschooling, but it does clearly make the point that homeschooling has helped make your travels possible. What is your opinion of homeschooling in general and how do you feel homeschooling parents could better take advantage of opportunities to travel the world with their school aged children? I think there are a lot of great things about homeschooling. Apart from obvious benefits of the ability to be flexible and travel, I think that if you want to have traditional values respected, values like saying, "yes ma’am," "please," and "thank you," homeschooling is very good. Also, it's so much more efficient because it's one student versus 20-30 in a classroom, so you can do so much more in-depth schooling in less time. You have to know whether or not you’re smarter than a 5th grader because when the kids get into 6th, 7th, 8th grade and on, they are learning at such a high level you have to be able to keep up or have the ability to hire a proper tutor. It’s important for them to learn to work with groups of kids and be involved in sports, so those are challenges that we all have to address with each individual child. I think there are great things happening now in terms of schools becoming more flexible. In some of the traditional high schools in California, for instance, kids are able to get life credits now when they travel. These programs give more people a shot at homeschooling in smaller doses. These are wonderful programs that I hope to see more schools embrace. Virtual classrooms and an open line of communication between parents and teachers are the keys to keeping these programs successful. #6 - If there was one thing that you could say to homeschooling moms who might consider picking up a copy of Travels with Gannon and Wyatt: Botswana, what would it be? I hope that they are able to not only homeschool, but they are able to encourage their families to get out on the road. And while they're traveling, make use of journals. Journaling is such an incredible way to remember experiences and delve deeper. # 7 - What gave you the idea to start writing adventure stories surrounding your travels? It happened when my sons were just 6 or 7 years old and we were in French Polynesia. We had been visiting these amazing, remote places, standing on top of a waterfall in Bora Bora and visiting a pearl farm in Tahiti. While visiting in a turtle rescue mission in Tahiti, the boys had an opportunity to release a giant sea turtle and back into the ocean. We started talking about how very few people were blessed enough to be able to have this experience and how we could share it. #8 - What is your ultimate hope and goal for the book series you are creating here? I hope that these books will ignite the love of travel and exploration in children. I hope it will make then realize that diversity is all around us and we need to embrace it and revel in it. It's good for everyone to remember that. Sometimes it's too easy to stay in our comfort zone. We need to break free of that. I want everyone to remember that every time you get on that airplane, or go on a long road trip, you are stimulated and you are learning something and you are growing. Thank you so much, Patti, for your time in answering these questions. Best wishes for your book series and I look forward to reading more! Not only can you read my review of this book, but you can enter to win a copy over at 5 Minutes for Books so be sure to check that out! Wow!! I love what she said about traveling with kids! As a home school mom, I agree with her completely. Traveling - seeing new places and experiencing new activities - is a wonderful learning experience for children. She's right that you can travel even with young children. It just takes a little extra planning ahead and preparations but kids can be great travelers too (better than some adults I know!). This book looks great to use with my guys to grow their love of travel!